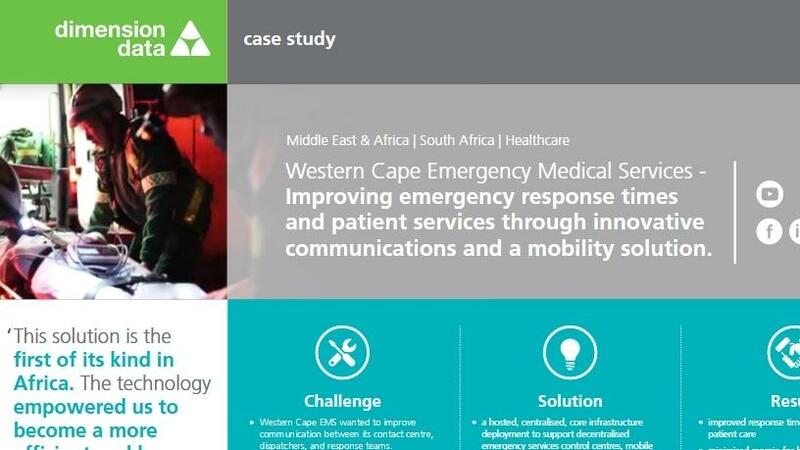 Western Cape Emergency Medical Services has introduced an innovative communications and a mobility solution that is helping improve emergency response times and patient services. The 'golden hour' in healthcare is crucial. Those 60 minutes, or less, after a traumatic injury or medical emergency when prompt medical treatment may prevent loss of life. This critical intervention means getting EMS professionals to the location and patient as soon as possible, as it could mean the difference between life and death. According to Dr Shaheem de Vries, Western Cape EMS, Western Cape Department of Health, this solution is the first of its kind in Africa, and has empowered the professionals to become a more efficient and lean organisation, while meeting patient demands in challenging conditions. Click here to download the case study and see how a hosted, centralised, core in-frastructure deployment helped support decentralised emergency services control centres, mobile devices, and medical facilities.